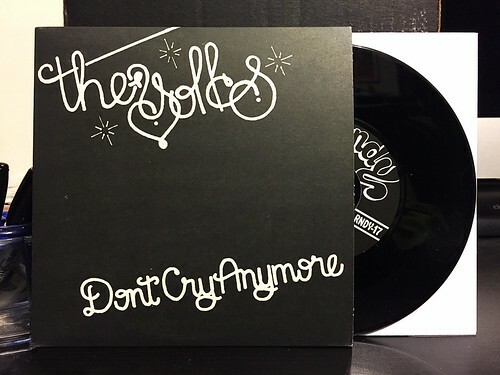 I Buy Way Too Many Records Dot Com: The Yolks - Don't Cry Anymore 7"
When I came across the first Yolks record, I became an instant fan of the band. That record was so catchy and just so much fun it would have been pretty difficult to not get caught up in its infectious grooves. On the second Yolks album, Kings of Awesome, the band changed things up a little bit. They took a somewhat mellower approach overall with mixed results, for me at least. I liked it sure enough, but it didn't grab me like their first LP. This newest Yolks 7" is kind of a like a microcosm of those feelings. The A-side reminds me of a lot of the songs on Kings Of Awesome. Built over a gently strummed, distortion free guitar, "Don't Cry Anymore" is a showcase for the softer, Everly Brothers influenced sounds The Yolks have been tinkering with. Tightly woven vocal harmonies put a bow on this package and while it's a perfectly good song, it's difficult to get too excited about. The best way I can sum it up is that I just think it's a nice song to listen to, but not an attention grabber. However on the B-side we have "I Wanna Be Dumb." This one is very much a throwback to the first Yolks album. Loud, fuzzy and brash; this is the version of the Yolks that I like the best. Just a bunch of dudes pounding out downstrokes, but keeping everything nice and melodic. I'll never say I dislike the A-side, but songs like "I Wanna Be Dumb" are what keep me coming back for more Yolks records.